Because this ensemble was only produced in 1959, it is very rare and valuable. 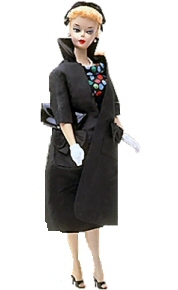 The black faille unlined coat should have a cloth tag with the TM behind the Barbie signature. The Apple Print Sheath Dress would be untagged. The coat has a gathered yoke in the back, big patch pockets and bow accents in the same fabric. The silk organza headband hat has a simple bow. A reproduction of this ensemble was included in the 1994 35th Anniversary Gift Set.